That's sweetly pla'd in tune.-"
As with just about every holiday the roots of Valentines day go very deep into the earth where you find a pagan festival at the core. It began with Lupercalia, an ancient Roman fertility celebration, in honor of the goddess Juno. This two day long feast included Roman ladies writing "billets" and placing them in large urns to be chosen by a man. He then would pursue the author of his note. Our modern interpretation of this holiday might include handwritten love notes, fresh bulbs of tulips and daffodils or a botanically scented bath followed by a foot massage. These are all simple, yet, heart warming deeds apropos for this sweet day devoted to love. The most widely used aromatic associated with love is the heart/base note of Rose. 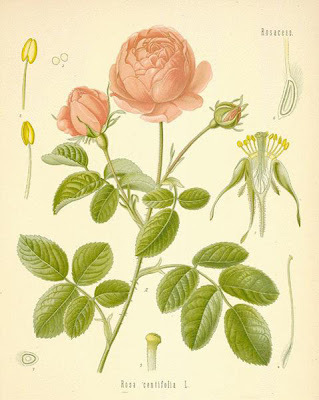 She comes to the botanical perfumer in many guises: Bulgarian, Turkish, Indian or French, Attar of Roses, Rose de Mai, Rose Maroc or Musk Rose or damascena, centifolia or alba. When in the form of a concrete the essence is solid, as an absolute it is thick, where as the distilled essential oil is thin when at room temperature. The essence of the Queen of the Flowers can be a deep red or a pale light yellow in color. If you exchange tokens of affection with a beloved today, consider creating a botanically scented item such as a solid perfume, body oil, salt scrub or some chocolate lip balm! Find more by typing Recipe of the Day into the search box located in the top left corner of the blog. A red colored tincture or infusion can be made by utilizing alkanet root. My sweet heart proposed to me on a bended knee on Valentines night, after he had prepared a home made dinner. He is my heart throb, my love, lover and beloved. I adore and cherish him! The botanical print above is from the website www.botanical.com, a terrific resource for more recipes and info on all things botanical.